Chase Sapphire has been teamed up with OpenTable for some time and now they have a new promotion called the First Friday Favorites. When you use your Chase Sapphire card at restaurants on the first Friday of the month, Chase will award you 3x points (instead of the regular 2x points) on your dining purchase. These first Fridays include: May 3, June 7, July 5, August 2, September 6, October 4, November 1, and December 6,2013 before midnight. There is no need to register for this program. The First Friday Favorite restaurants are all members of the OpenTable Network of restaurants, which you can use to book reservations online or on your smartphone. As I’ve shared before, OpenTable rewards points for making and completing restaurant reservations. Now if you own a Chase Freedom card, I wouldn’t bother participating in the Chase Sapphire First Friday bonus since this current Freedom rotating 5x categories includes restaurants until June 30th. The First Friday bonus can be a nice little boost for some Sapphire cardholders. Coincidentally, the only 2 days of the week that the wife and I eat out together are Fridays and Saturdays, so we may be able to get some extra points starting July 5th, after the Freedom 5x restaurant category ends. 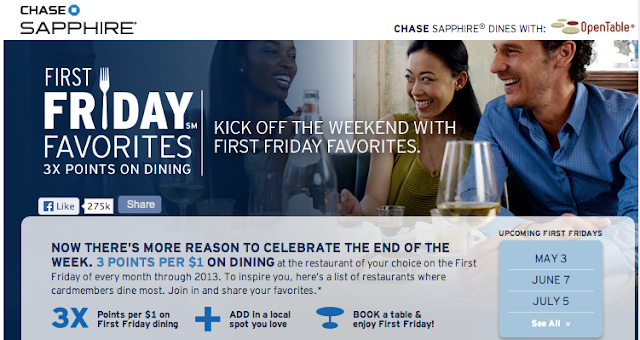 Read more about the Chase Sapphire First Friday Favorites promotion here.